All current kits available on my Etsy site here. The items below show some of my past offerings. All my kits come with fully illustrated instructions for the wirework skills they require, as well as all materials. Bracelet Kit $20. Includes matching earring materials. Add spiral charms for more style. Choose from color ways on the right. You can specify other wire colors than shown. Use figure eight links and simple loop bead links to create a long, graceful necklace and one pair of earrings. 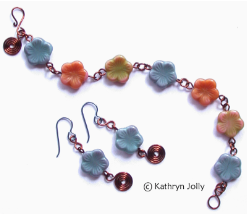 Each kit includes Bowerbirds design color mixes in Czech glass beads temporarily strung in order, matching wire and fully illustrated instructions. Just follow the instructions and put together your necklace! 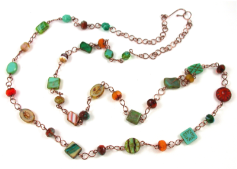 Choose from: bright colors; southwest colors; spice colors (shown as finished necklaces on the Buy Our Jewelry page). Other mixes include neutral mix, new world mix and green earth mix (photos to come). 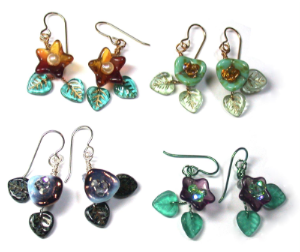 Explore the world of Czech glass flowers and leaf jewelry. 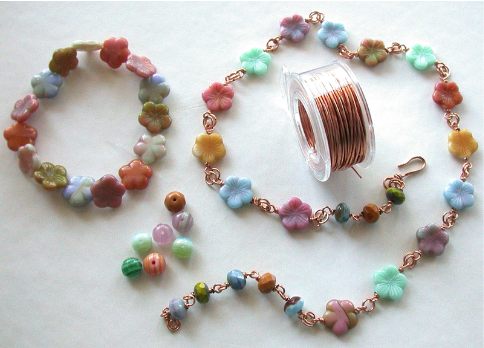 Kit includes specialty beads, four feet of matching wire, hypoallergenic earwires, and illustrated instructions. Shown: various color ways available. 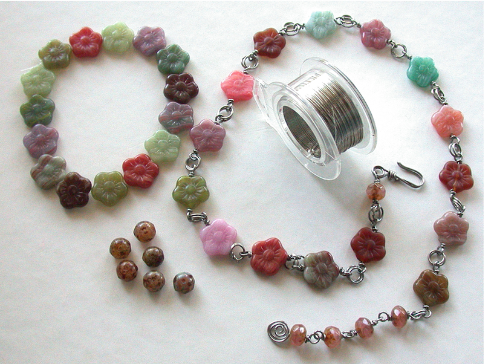 Make this project and learn how to make wrapped bead links and clasps, jump rings and end curls with 20 gauge art wire. The kit is available at shows in various color choices such as those shown below; however, exact bead style and color choices are subject to availability when ordered.